Six Sigma is a people-driven process. With the priority that Six Sigma places on statistics, data analysis and process evaluation. It is quite important to remember that the success of a project is not based on quantifiable factors. More or less, success is based on human factors. The heart of Six Sigma’s success is found in the individuals who are trained in the program and those who make up project teams. The level of performance of a Six Sigma project tends to match the level of skill, dedication and commitment of the individual members of the team. Six Sigma is most beneficial to a company that builds a critical mass of employees who are trained in its practices and principles. Black Belts focus full-time on Six Sigma and comparatively make up no more than one percent of the workforce. Trained Green Belts have a strong knowledge of basic Six Sigma principles and the ability to implement them on a project team since they fulfil their regular workplace duties. A large population of Green Belts can allow management to spread Six Sigma throughout the organization, making sure that the company realizes positive change to quality improvement. Green Belts, who play a crucial role in the process are often unnoticed. While outlining the roles that contribute to a successful process, many think that the most important are those Champions who support Six Sigma and ensure that projects are aligned with overall business strategy or the Black Belts who work full time to ensure that resources for deploying Six Sigma projects are maximized. Green Belts help bridge the gap between Six Sigma theory and real world application. They are skilled team players who are chosen for their subject matter expertise and dedication, to results aimed at improving process quality. Green Belts most often are selected from the ranks of the company and can include technicians, operators, process supervisors and even project sponsors. Green Belt training program teaches candidates the basic tools used by a project team and how to apply DMAIC skills that relate to a Six Sigma project. The 10 day training program is often taught by the Black Belt who will oversee the project team. This training helps Green Belts learn to speak the same language as Black Belts and also helps them to understand and apply basic Six Sigma tools. 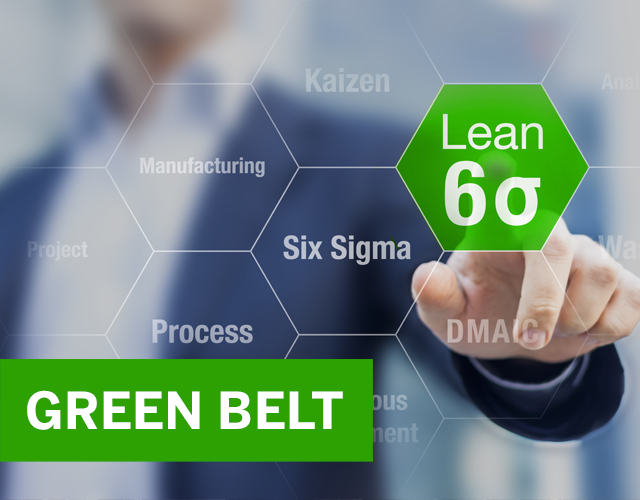 While Green Belts do not receive complete Six Sigma training, they can make valuable contributions to the project and even lead a project team with the assistance of an experienced Black Belt. The benefits that a company receives from a Green Belt trained employee, who has served on a successful project team does not end when the project is completed. Given the proper training, Green Belts will never view their work the same way again. Once internalized, the highly-quantified, data-driven approach to Six Sigma gives Green Belts the quantitative tools to make decisions based on hard numbers instead of following their gut feeling. This training also helps Green Belts identify areas of quality improvement required in the daily operations of the business that they may not otherwise realize and gives them the tools to pursue improvement in those areas.